Paris or Poissy, France, ca. 1320-1325. Mid 17th-century French red morocco gilt over thick wooden boards, central gilt stamp of the Symbols of the Passion on each cover, gilt fleurons on spine, one clasp (of two) attached from edge of upper cover to a pin on edge of lower cover, g.e., in a pale brown fitted cloth case, title gilt.--Cf. Sotheby's, 2002. Melvin R. Seiden Collection, 2007. Illuminated for the royal abbey of Poissy; was still in the abbey collection in the early 16th century, when further prayers and illuminations were added, and remained in the abbey presumably until the 17th century; J. Worth sale (London, Sotheby's, December 9, 1974); sale (London, Sotheby's, December 3, 2002). Ms. psalter and processional for Dominican use; written and illuminated in Paris or Poissy, France, ca. 1320-1325, with further prayers and illuminated initials added in the early 16th century. Decoration: 8 large historiated initials; illuminated initials throughout; French gothic style. The initials display the conventional subjects for 8-fold division of the Psalms. These are: 1. fol. 14r: Historiated initial B (Beatus vir), 30mm x 30mm, David harping. --2. fol. 44v: Historiated initial D (Dominus illuminatio mea), 30mm x 32mm, David kneeling pointing to his eye, the head of God appearing from a cloud. --3. fol. 62v: Historiated initial D (Dixi custodiam), 30mm x 33mm, David kneeling pointing to his tongue, the head of God appearing from a cloud. --4. fol. 79v: Historiated initial D (Dixit insipiens), 30mm x 32mm, A fool with a stick with a human head eating a loaf. --5. fol. 95v: Historiated initial S (Salvum me fac), 30mm x 32mm, David below in water, hands folded in prayer to God leaning down from a cloud above. --6. fol. 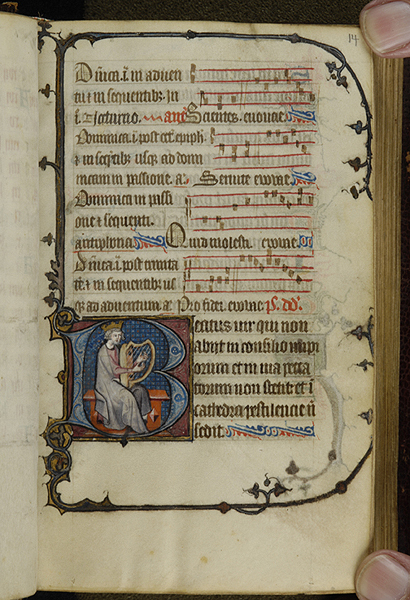 116v, Historiated initial E (Exultate deo), 31mm x 32mm, David playing the bells. --7. fol. 136v: Historiated initial C (Cantate domino), 31mm x 32mm, Three priests (but bearded and not tonsured) singing at a lectern. --8. fol. 156v: Historiated initial D (Dixit dominus), 31mm x 32mm, God the Father and God the Son seated on either side of a tripartite globe, the Dove descending from above.--Cf. Sotheby's, 2002. Artist: style of illumination is similar to that of artists in the circle of Jean Pucelle. Texts: A Calendar (fol. 1v), graded, including as totum duplex festivals in burnished gold script St. Dominic and his translation (5 August and 24 May), the Dominican saint, Peter Martyr (29 April), and the patron of Poissy, St. Louis of France (24 September), and as ordinary feasts the four Dominican anniversaries (4 February, 7 July, 5 September and 10 October); a ferial Psalter (fol. 14r), from the first Sunday in Advent, with the Canticles (fol. 207r), and Litany (fol. 220v), with a double invocation of Saint Dominic and including Saint Louis, followed by prayers invoking SS. Dominic and Peter Martyr (fol. 225r) and for the king (fol. 225v); a Processional, from Palm Sunday (fol. 227r, 'Pueri hebreorum...') and including the feasts of SS. Dominic (fol. 255v) and Louis of France (fol. 260v); the Office of the Dead (fol. 268v); and second Litany (fol. 281r), also with a double invocation of Saint Dominic and including Saint Louis; the Commendation of Souls (fol. 284v) and other prayers. The manuscript originally ended on fol. 292v. In the early sixteenth century further prayers were added, including hymns to St. Nicholas (fol. 193r) and the Virgin, benedictions of candles (fol. 295r) and psalms, and other hymns, including those for St. Louis of France (fol. 312v) and the Dominican saint, Thomas Aquinas (fol. 314r), and for the reception of novices (fol. 324v), all ending on 328v.--Cf. Sotheby's, 2002. Collation: i¹³ [of 14, blank i cancelled, perhaps the leaf now forming the pastedown], ii-xi¹², xii¹²⁺¹, xiii-xviii¹², xix¹⁰, xx¹⁸, xxi-xxii¹², xxiii¹⁰, xxiv⁸, xxv¹, xxvi⁶, xxvii-xxx⁸ [last two blank], mostly with traces of horizontal catchwords and correctors' notes. Last five gatherings added and illuminated in the early 16th century by the nuns of Poissy.--Cf. Sotheby's, 2002. The text of the manuscript was systematically checked twice after it was written but before the book was bound. At the end of almost every gathering of the 14th-century part of the manuscript is the tiny word 'Corr' (correctus) and quite often in a second hand 'item corr' (clearly on fols. 61v, 158v, 182v, 246v, and 290r; and partly visible on fols. 97v, 109v, 146v, 170v, 194v, 218v, 258v, and 290r).--Cf. Sotheby's, 2002. Musical notation: 4-line red staves.